The Gardner Pie Company, located in Akron, Ohio, has been family owned and operated since 1945 and offers a wide variety of premium homestyle pies for farm markets, in-store bakeries, retail bake shops and the food service industry. 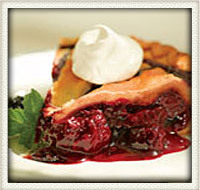 Gardner Pie is completely dedicated to baking and selling only the very best pies. That's all they do. No cakes, no doughnuts - just pies. Using only the best raw ingredients, like real cane sugar, kosher dairy products and premium spices, it makes a difference you can see and taste! You won't find starchy fillers or preservatives on their ingredient list – ever. A variety of top crust patterns and two crimp options allow you to develop a look that's all your own. Or work with Gardner to create a new design. You'll taste the Gardner difference in every delicious bite! Most flavors are available in 8", 9" and 10" sizes. Gardner distributes locally through frozen food distributors. Call us for an appointment to discuss your needs and we will locate a vendor for you.